In the year AD 43, following an invasion led by the Roman Emperor Claudius, the Romans founded the town of Londinium (the Roman name for London). Although Britannia was abandoned by The Romans thousands of years ago, echos of London ancient past can still be witnessed in certain parts of the city. Interested in walking in the footsteps of the Romans? Book a tour to visit the Roman Walls today and scroll down for some of the amazing history you’ll be able to explore, all without leaving the city! The original city was largely contained within a set of defensive walls, roughly contiguous with the modern day Square Mile, although not extending quite so far west. The walls were enlarged in medieval times, and significant sections can still be seen. Meanwhile, a host of other Roman treasures can be spied in the basements of the City. The old Roman wall can still be glimpsed at a handful of sites around the City. Only one section still follows the modern boundary of the Square Mile. The wall’s continuation to the north can be accessed via the courtyard of the Grange City Hotel on Cooper’s Row. If you only seek out one piece of wall, head here. Excellent signage provides a history of the wall, and you can even walk through the structure via an arch to the left (although this and other upper sections are medieval). The next visible stretches can be found along the aptly named thoroughfare of London Wall, towards the Museum of London. The wall fragments here were also part of a large Roman fort, which nestled in the north-west quarter of Londinium. There’s plenty to see, including towering remains in the gardens of the Barbican and further, well-labelled structures along Noble Street. An excellent view can be gained from the Museum of London’s Roman gallery. Needless to say, this also contains plenty of artifacts from Roman London, and is an essential stop for anyone wanting to learn more about our city’s origins. These are the only sections of wall on outdoor display. Other fragments remain in various basements around town, and require special access. One of the best, the old fort gate, is locked up in the car park near the Museum of London. The remains can be visited on regular tours, and Open House weekend, but a less substantial section can be seen in the car park at any time. Another impressive fragment lurks in the basement of the Old Bailey, and several office blocks along the old perimeter, but you need special permission to visit. More accessible (but trapped behind an entry charge) is the section of river wall inside the Tower of London. The most spectacular Roman remains of all can be found in the basement of Guildhall Art Gallery. Historians had long conjectured that Londinium must have had some kind of sporting arena. It was only discovered in the 1980s, during the building of the gallery. The amphitheatre’s remains are now on permanent exhibition, and are free to visit during gallery opening hours. You can see the footprint of the old amphitheatre while standing above in Guildhall Yard. Its perimeter is marked out in grey paving. Three City churches also boast significant Roman remains. St Bride’s off Fleet Street shows off a Roman pavement in its crypt. All Hallows by the Tower’s crypt museum houses the tessellated floor of a domestic house from the period, as well as a wonderful model of Londinium from the 1920s. St Magnus the Martyr, meanwhile, displays a probable timber from the Roman version of London Bridge (below), which crossed the Thames from this site. The Temple of Mithras, rediscovered in the aftermath of the second world war, was later shifted to Cannon Street and displayed as one of London’s most visible Roman remains. It was boxed up and put in storage to allow development of a huge new headquarters for Bloomberg. That dig uncovered many more Roman artefacts, along the course of the buried River Walbrook. The temple will be reinstated on its original site, and on public display again in a couple of year’s time. Lower Thames Street is not one of the most exciting thoroughfares in the capital. It hides an ancient secret, however. Beneath an anonymous office block lie the remains of an extensive Roman bath house and villa. The site is usually closed to the public, but is occasionally accessible at times such as Open House weekend. 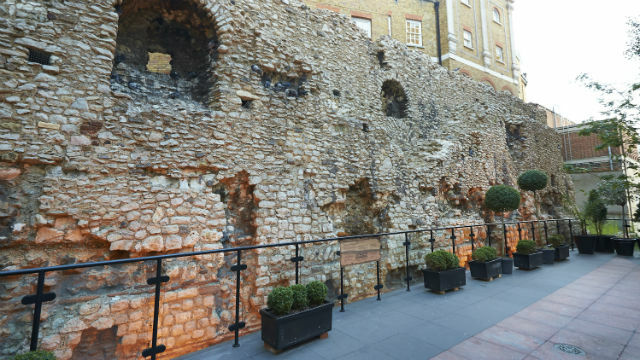 Many other fragments of the Roman city exist in private basements throughout the Square Mile. Most are rarely accessible, though there are exceptions. A basement hairdressers on the western edge of Leadenhall Market includes a short section of the old Forum which visitors will get access to on one of our many tours. 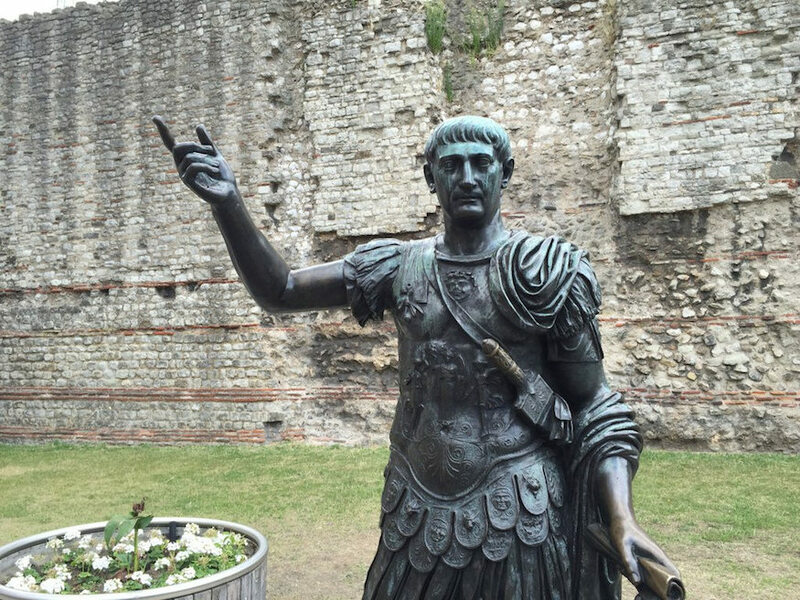 As always, more information on how to view the Roman ruins of London is available on our website as well as many other amazing and educational experiences!